The ingredients for this EQ are simple: a classic Baxandall tone circuit and a clean, modern rack unit — but TK have added to the recipe with some spice of their own. TK Audio are small Swedish manufacturers of a range of analogue outboard gear, the name being derived from founder Thomas Kristiansson — who is also the brains behind another company, Vintagedesign. 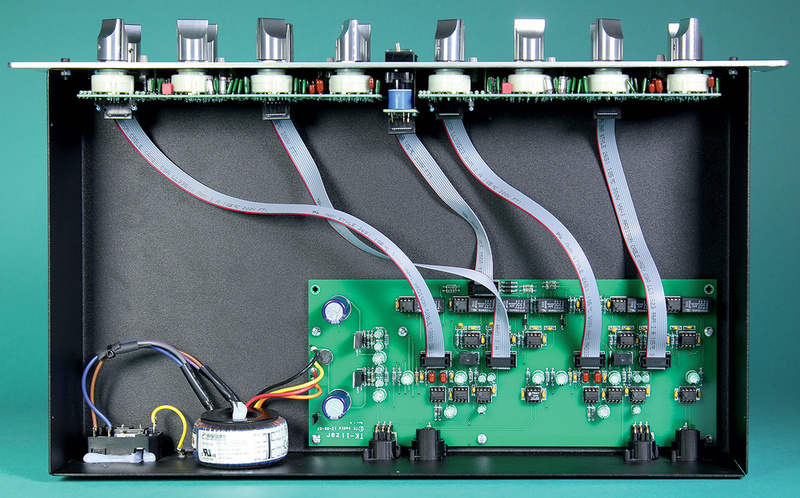 The two companies have a slightly different emphasis, with Vintagedesign, as the name implies, focusing on high-quality implementations of classic transformer-balanced preamps and processors, and TK producing more modern solid-state creations. Although such IC-based designs are inherently less expensive to produce — and consequently, I'm sure you'll be pleased to learn, to purchase — the TK approach can't, by any stretch of the imagination, be considered 'building on the cheap'. I've used a few of TK's devices now and have been impressed by both the sonic and general build quality of them all. To date, only one of those has graced the pages of SOS: you can read my review of the BC1 MkII compressor — TK's take on the classic SSL G-series bus compressor — in the SOS on-line article archive at /sos/jan12/articles/tkaudio-bc1mkii.htm. The latest TK gadget to arrive at SOS Towers is the TK-lizer, which is a Baxandall-style stereo EQ that's intended primarily for mastering or master-bus duties. As a product intended for these applications, it can be used either in conventional left/right mode, or in a Mid/Side (M/S) configuration, which I believe adds massively to its usefulness. The ability to operate in the M/S domain opens up the options: for example, to add a bit of 'air' or to apply a high-pass filter on the Sides signal, or to manipulate some of the elements that are so often panned centrally, such as bass guitar, kick and snare drums, vocals and hi-hats — and all without needing to use an external M/S encoder/decoder. 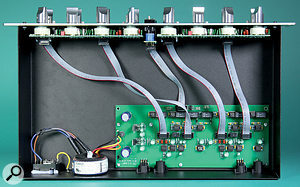 The balanced analogue I/O are presented on panel-mounted XLRs connectors. Remember that I said TK aimed to create more 'modern' products? Well, the venerable Baxandall EQ is hardly that! Nonetheless, while the basic EQ circuit may have been around since the 1950s, the implementation here is thoroughly modern. The audio I/O is electronically balanced, and the 2U rack case has a lovely solid, uncluttered appearance, clear white legending contrasting nicely with the black metalwork. Each of the 16 main front-panel controls is nicely finished with a pleasingly sculpted aluminium knob, which feels just right to the touch. Reassuringly, they're switched resistors rather than variable pots, which makes channel matching precise and accurate recall easy. Centrally positioned on the front panel is a pair of switches that govern the In-Bypass and M/S-L/R statuses, and these are cleanly lit in white when engaged. Between these is a small silver-coloured toggle switch, which allows the user to mute either the Mid or Sides signals independently if desired, a feature I found really useful in practice. There are three bands of EQ per channel, 'Low', 'Medium' and 'High', as well as a level control and a switchable high-pass filter. The Medium band is always a bell filter, whereas the Low and High bands are switchable between bell and shelf types. For the Low band, you have the choice of 28Hz, 48Hz, 72Hz, 132Hz, 195Hz or 255Hz centre/turnover frequencies, and to apply up to ±4dB gain. The High band has options of 4kHz, 7.2kHz, 12kHz, 16kHz, 20kHz, 25kHz; and for the Medium you can switch between 400Hz, 630Hz, 870Hz, 1.3kHz, 2.4kHz and 7.2kHz. The 12db/octave HPF can be set at 25Hz, 30Hz, 35Hz, 40Hz, 45Hz or 100Hz. Checking the frequency response of the various filters and settings using a Lindos MS20 audio analyser confirmed that the curves were the shape you'd expect from a Baxandall circuit. The boosts and cuts were pretty accurate and within acceptable tolerances, and the two channels were very closely matched. As the TK-lizer is a solid-state device, there's little to see inside the box, although it's reassuring to note such a clean and tidy layout. Numbers, of course, are a rather abstract concept when it comes to making decisions about frequency balance; while they can get you into the right ballpark when EQ'ing, they're pretty meaningless if you don't also use your ears! And when you do start to trust your ears, you find that the TK-lizer is a real joy to use. It's all about smooth, effortless control, and although the numbers suggest only the tiniest of changes — a couple of dB boost here, another four there — the sound is clean, yet musically flattering. The specified clipping point of +27dBU means that there's plenty of room to accommodate whatever boosts you apply, and there was certainly no hint of audible noise or distortion during my tests on a range of stereo files and both master and drum bus signals. The TK-lizer is being described by TK Audio as a "mastering and main bus EQ”, and I can well see why. The subtly flattering effect can be combined with the M/S controls to really get a complex stereo signal into the sweet spot — because not only can you EQ the Mid and Sides signals differently, you can also alter the stereo width of the signal more generally by rebalancing the M/S levels. However, this EQ is certainly not restricted to such applications: being a dual-channel unit, it's perfectly possible to use each channel as a separate mono EQ, and that brings into play a whole range of general mix applications. In fact, I could find no major points of criticism, but I picked up the phone to chew over a few ideas for future development with designer Thomas Kristiansson. This isn't the place to go into what might or might not be added in a future version, but I will say that talk turned enthusiastically to potential routing options which, on some future revision, could enhance this unit's versatility still further. It's really nice when designers embrace feedback in such a positive way — and it's one of the benefits of small companies such as this that they have the freedom to consider such things. TK Audio have again come up with a genuinely useful implementation of a processor that has already proven its worth over the years. Although ostensibly clean-sounding, some subtle musical flattery makes the TK-lizer very easy on the ear, and, like other processors in this range, while the price might be just out of reach of a typical bedroom producer, it's well within the means of plenty of project studio owners, never mind the many mastering studios who should be interested. In other words, given the build quality, M/S functionality and class of product the TK-lizer is up against, it's rather competitively priced. The most obvious alternative that's currently on the market is the Dangerous Music Bax EQ. While that unit's tech specs and frequency options offer very slightly more impressive reading, it's almost twice the price of the TK-lizer here in Europe — and if you want to work in M/S, you'll need a dedicated M/S matrix too. Clean, but still flattering sound. M/S option makes this a versatile EQ. None, given the quality and price. This is a subtle twist on the classic Baxandall EQ circuit. Already good-sounding in its own right, the EQ really benefits from the on-board M/S matrix. The price, too, is competitive. Zen Pro Audio +1 803 937 6012.